The Powers That Be Feel the Pinch – Or Even an Identity Crisis? 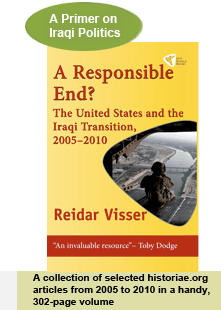 The contradictions within the Maliki government were of course apparent long before the January 2009 elections, but the results of those elections have certainly accentuated internal divisions. Already in 2008, there were plenty of examples of intra-Shiite competition between Daawa and the Islamic Supreme Council for the Revolution of Iraq (ISCI). In an interesting new development, the remnants of the Tawafuq bloc have recently criticised the decision of the Iraqi federal supreme court to postpone to 8 April its ruling on what constitutes an “absolute majority” (see previous entry), accusing it of being “politicised”, i.e. not supporting their own favourite Ayad al-Samarrai as the new parliamentary speaker. In other words, the “powers that be” bloc (whose nucleus was always KDP/PUK/ISCI/IIP) criticises unspecified other parties for being, well, the powers that be! Meanwhile, ISCI is employing its favourite weapon, anti-Baathism, to try to recover some of the ground it lost during the local elections. Iran seems pleased at the idea of a return to a more sectarian discourse, and there will always be Sadrists prepared to join this bandwagon – regardless of continued efforts by others in their camp to work in a more cross-sectarian direction. As for Maliki’s opening towards cooperation with Salih al-Mutlak in local government, this is arguably some of the most courageous and quintessentially Iraqi he has done as premier. And while the forces that push in a more sectarian direction remain formidable, Maliki should take comfort from some of the more implicit reactions from other corners. When the Hadba bloc in Mosul calls for Iraqi central government forces to replace the Kurdish peshmerga this is undeniably also a step in the direction of recognising the idea of a non-sectarian Iraqi army as an achievable objective. Posted in Iranian influence in Iraq, Iraqi nationalism | Comments Off on The Powers That Be Feel the Pinch – Or Even an Identity Crisis? It is becoming increasingly unfashionable to think long and hard about Iraq. In Washington, a great intellectual trek from Iraq to Afghanistan is already well underway. Despite the increasing similarity between Obama policy on Iraq and priorities defined by the Pentagon in the latter part of the Bush presidency, critical Democratic voices on Iraq policy are gradually becoming something of a rarity, with growing support for a narrative to the effect that “the peaceful conduct of the January 2009 local elections represented a transformation of the military gains during ‘the surge’ to political gains in the shape of a more mature form of politics in Iraq”… Full story here. Imposing the Law? What Law??? Today’s announcement by Tawafuq member Umar Karbuli that the Iraqi parliament will wait until 14 April to revert to the issue of who should be the speaker of the assembly and also seek advice from the supreme federal court is interesting for two reasons. Firstly, the issue where legal “clarification” is sought is one on which the often-ambiguous Iraqi constitution of 2005 actually appears to be crystal-clear: the president is to be elected with an “absolute majority of the total members of the assembly”. Exactly the same wording is used to define the quorum of the assembly, which has always been considered to be half of the total number of members plus one, i.e. 138 out of 275. When something else has been intended, the expression “simple (basita) majority” has been used, or there is reference to “a majority of those who voted” (as in the constitutional revision clause). Obviously this is an attempt by Tawafuq and its allies to circumvent the requirement of 138 votes, which proved too difficult last time an attempt was made (Ayad al-Samarrai received 136 or 137 votes on 20 February). Secondly, this issue is interesting because Daawa members and advisers to Nuri al-Maliki have expressed somewhat divergent views on the question of seeking advice from the high court. On 21 February, Haydar al-Abbadi expressed satisfaction about this kind of procedure, highlighting his confidence that the court would maintain the view that an absolute majority would have to be calculated on the basis of the total number of assembly members. But one day earlier, Hasan al-Sunayd had indicated that he preferred the election of the candidate with the highest number of votes, regardless of the requirement of an absolute majority. So far, Daawa has vacillated in the speaker issue, reportedly voting blank on 20 February (and hence against Samarrai, who is the candidate of the ISCI-KDP-PUK-Tawafuq bloc). This is of course not the first time Iraqi parliamentarians have treated the 2005 constitution in a creative fashion. For example, all the timelines relating to constitutional revision have been arbitrarily extended and now appear to be largely forgotten. Posted in Iraqi constitutional issues | Comments Off on Imposing the Law? What Law?? ?